Do you have any idea how expensive it is to do a complete Hotel renovation for a building so old? $ 40 buys you the single room and $80 get's the doubles and a mere $ 90 to $100 get's you the refurbished room with ensuite? The prices are modest and fair, you get the same deal all over Tassie , not to mention Vic for old Pubs. 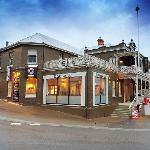 a night at the Maroondah Motor Inn costs around $ 120 per night for a real dive, not a historic Pub! What do expect for your money? it is not Thailand were people earn $ 300 per month! get real! Recibe una respuesta del personal y antiguos clientes de Deloraine Hotel.